We are excited to announce that we are reviving our Client of the Quarter award! This award celebrates the dedication and success of a particular Project Place client. This quarter, we recognize Yolette for her hard-work, motivation, enthusiasm and kindness. A framed photograph of Yolette will be hung alongside previous Clients of the Quarter in the Project Place lobby. Yolette came to the U.S. from Haiti in 1993, and moved to Boston in 2001. After being evicted in 2018, Yolette had her first experience with homelessness. Last year, Yolette was staying at an overnight shelter in the South End. She was going to the Women’s Lunch Place every day, passing by Project Place. One day in July, she decided to come inside. She says that decision changed her life. 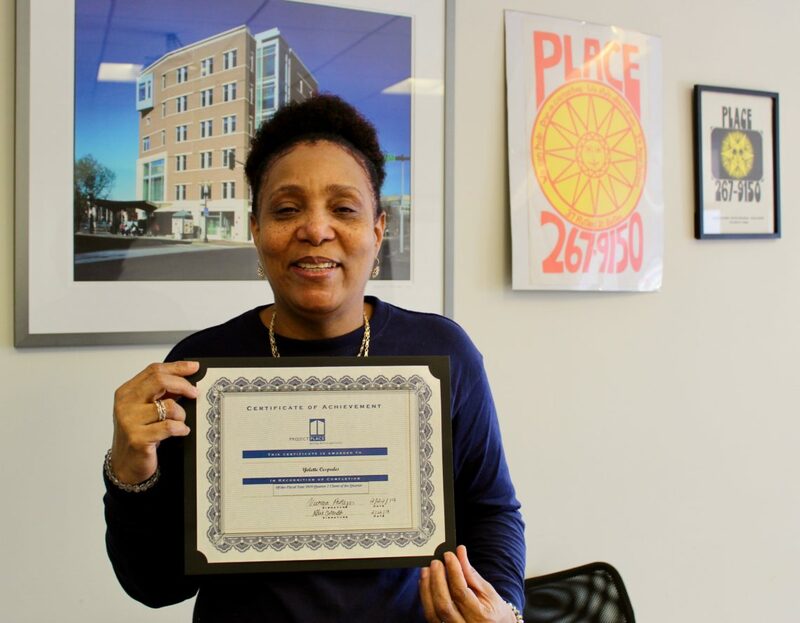 After completing Project Place’s Work Ready program, Yolette joined our Clean Corner’s Bright Hopes social enterprise, which provides facility maintenance services. During the three month program, Yolette began each day by cleaning the Project Place building and greeting staff as they entered. She describes that experience, saying, “Here everyone is smiling and saying good morning to me. That’s a very good thing, you know. The staff were always telling me they really appreciate the job I was doing and that was making me do even better.” She says that the work training she received at Project Place, especially the Customer Service class, helped prepare her for her new job, in addition to the support and references she has received from her case-manager and instructors. Yolette is currently living at Betty’s Place. She explains that, “Betty’s Place has helped me a lot…I have keys to open my own door. I don’t have to worry about where I’m going to be tonight or what bed I’m going to sleep in.” She is busy sending out rental applications to find more permanent housing for herself. She says this often feels like a second job, but she is working hard every day in order to save up and find a place to call home. She now looks forward to her future with determination and optimism, knowing she has a support system who want to help her succeed. Yolette’s kind and gentle spirit, and determination to succeed at whatever she does, make her a powerful and positive presence. Project Place would like to thank Yolette for being an inspiration and a valued member of our community.